Charger offers modern coupe styling with four-door functionality. It is available with a 250 horsepower, 3.5-liter High-Output V6 engine or the legendary 340 horsepower, 5.7-liter HEMI V8 engine. 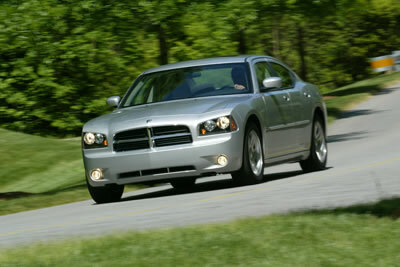 With the longest wheelbase in its class, Charger offers a spacious and refined interior and a no-nonsense driver cockpit. It is ergonomically sound and provides world-class attention to fit and finish. The Charger’s seating position is more than two inches higher than the previous generation Dodge sedan, which gives a comfortable command-of-the-road view for both driver and passenger. Road/Track Performance Group and the Charger Daytona R/T package are all availablein the first year of production.